Life is a constant change. Each journey of a thousand miles starts with a single step. Life is about moving forward, accepting changes in time and people, looking forward to what makes you stronger, better and more complete. Life goes on: No matter how wrong you've done, there is always time to do right. No matter how bad you are, there is always time to be good. As long as God gives you another chance to see another day. Tragedy depends on the way you see it. If you chose to be a victim of the world, anything which happens to you will feed that dark side of your soul, where you consider yourself wronged, suffering, guilty and deserving punishment. If you choose to be an adventurer, the changes - even the inevitable losses, since everything in this world changes - can cause some pain, but will soon thrust you forward, forcing you to react. You will never find true happiness until you come to terms of accepting the bad that has happened to you in life, deeply forgiving yourself and other's for the hurtful things, releasing yourself from that agony by moving forward with out holding on to grudges, regret or shame and learning to give then to receive; then you will surely know what true happiness feels like. Positive thinking helps to keep away negative happenings. A bad attitude is like a flat tire on which you can't move your life forward. To move forward you have to change your mindset to positive mode. Except for the word change all other things in this world are subject to change. It is an inseparable part of life. Some changes bring progress while some do not but there is no power that can stop the process of changing. The wise people make the best use of change and take it as an opportunity while the rest stare helplessly at the change taking place. As Winston Churchill pointed out, if one wants to attain perfection, he or she has to change very often, which is an inevitable part of life and if you fail to change yourself, and remain stubborn in the past, you will not be a part of future. Change is inevitable, change brings about a change in life, and change should be welcomed and cherished and not despised. 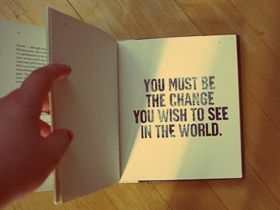 Send these change quotes to your friends or others which throws light on the view of life.